Photos courtesy of Starr Ackerman, IK Multimedia. 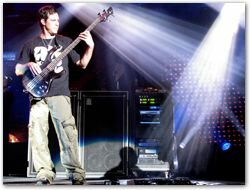 StompIO on TOUR in Front of Millions with Dave Matthews Band 2008 - Stefan "Fonzy" Lessard "For a month and a half now, Fonzy has been touring with StompIO to control the tones of Ampeg SVX in a virtual rig on stage, using IK's bass amp and FX plug-in to access the legendary bass tones of Ampeg." See or read IK Multimedia's interview with Fonzy. 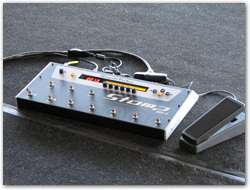 IK Multimedia Stomp IO USB Foot Controller and Audio Interface is available from zZounds. VocalTuning.com has announced its new online service, the first of its kind to offer music producers and singers a new way to get vocals perfectly pitched. The service consists of a small team of dedicated engineers, all with vast experience in the music industry, having produced, tuned and edited vocals for releases on many labels around the world. Broadjam has unveiled a download sales mechanism which allows indie artists to sell their work through their own website hosted by Broadjam and/or through Broadjam's download store. Sell your songs for $.99 and receive $.80 from each sale. DontCrack.com has announced the launch of their community site that hosts and supports software targeted to musicians, audio programmers and sound engineers. Visitors will find hundreds of freeware downloads for Mac and PC, forums to communicate, and a secure boutique where they will find hard-to-find, uncommon shareware. Propellerhead Software has announced the discontinuation of development and support for ReBirth. The legendary product will now be available for free at ReBirth Museum, which will include articles, interviews, historical information, the ReBirth song and Mod archives, a discussion forum, downloads of ReBirth 2.0.1 and much more. ActoGuitar: Free Guitar Lessons provides beginner and advanced guitar instruction in an online classroom environment through articles, audio clips, and demonstration videos. Best of all, it's interactive. You can ask questions and upload your work to get feedback from other students and instructors alike. Audiocourses.com has unveiled a new audio production mixing and mastering course delivered completely online over the Internet, with software and materials from waves.com. Zicos has announced its "shortcut to news" site, an aggregate web news extractor which allows visitors to quickly keep track of news published by over 90 renowned web sites from around the world covering the following topics: Pro Audio, Mac, Tech / PC, Downloads. Full details. If you need reliable, high-quality live-sound speakers, if you're on a budget, and if you're something of a do-it-yourselfer, you might be interested in Larry Mundy's new book, "Design and Build Your Own Live-Sound Speakers." See our review!. UVI Workstation is a multi-timbral instrument that provides unlimited parts, integrated effects, live performance features, a smooth real-time workflow, and much more. Note that the current version is a beta release. Windows or Mac. Sonoma Wire Works offers RiffWorks T4, a free edition of RiffWorks guitar recording software that includes looped recording, automatic track creation, InstantDrummer, effects, song posting, online collaboration, and a Quick Start tutorial in 14 languages. Windows or Mac. Voxengo offers several free VST plugins at its downloads page. The latest is Sound Delay, an auxiliary multi-channel signal delaying plug-in for professional audio applications. Multiple platforms. Traverso DAW is a cross-platform, multitrack, audio recording and editing suite, with an innovative and easy to master user interface - a complete solution from recording to CD Mastering. Linux, Mac OS X and Windows. Native Instruments offers Kore Player, a free software instrument designed for use with Kore Soundpacs. Includes six Native Instruments sound engines and provides ready-to-play sounds. PC or Mac. TrakAx.com offers TrakAxPC, a freeware tool for creating professional music and video mixes in an easy-to-use and fun environment. Use it to create a music track for your MySpace page or a video for YouTube. Garritan offers 2 free interactive courses: 1) OnlineJazz Course, based on Chuck Israels' new book, and 2) Online Orchestration Course, based on Rimsky-Korsakov's classic text. In both courses, you can simultaneously hear and see examples where audio follows the score. Algo Music offers 3 VSTi plugins for Windows: 1) Arpy, a free "groove generator with a unique sound," 2) StringSynth, which emulates the string synthesizers of the late 70's made famous by ARP and Solina, and 3) PhadiZ, a free phase distortion synth with lots of stereo options, including a unique panning/filter swoosh sound. Native Instruments offers Beatport SYNC, a free audio player with basic DJ functions. Based on award-winning TRAKTOR 3 technology, it lets you mix tracks like a DJ using the two virtual decks, a crossfader and auto beat sync function. Many other features. For Mac and PC. Tab Guitar Lessons.com offers several free guitar-related downloads: 1) Advanced FretPro - Guitar Fretboard Trainer with Chord and Scale Library, 2) Ultimate Guitar Chords eBook, 3) How To Read Guitar Tab Guide, and 4) Free Metronome Software. Finale NotePad 2008, a free music notation software for Windows and Mac, has some new features, including ability to import and export MIDI files. Nerds.de offers LoopBe1 Virtual MIDI Driver, a free software MIDI driver for transferring MIDI data between computer programs by connecting a MIDI out-port of an application to any other application's MIDI in-port. Windows 2000/XP/Vista only. Hurchalla dsp offers Maple Virtual Midi Cable, a free software MIDI driver that can connect any MIDI applications on your system. See, also, Maple Midi Tools, a free host program for MIDI plug-ins, which includes Maple Virtual Midi Cable. Windows 95/98/Me/2000/XP/Vista. Frieve offers Music Studio Producer, a free MIDI sequenecer, DAW which can host VST(i). Check site for other free downloads. Studio Devil StudioDevil British Valve Custom is a free guitar tube amp emulator plug-in featuring authentic digital vacuum-tube modeling and accurate tone stack filtering. Compatible with all VST hosts for the PC. SampleSwap.org offers 4.6GB (7,579 sounds) of free audio samples. The AIFF/WAV collection currently includes 1,420 techno, hiphop, trance, and drum and bass loops and breakbeats, 950 drum hits, 874 sound FX, 581 instrument samples, 579 vocal samples, 440 melodic loops, and more. Registration required for access to highest quality files. KV331 Audio offers SynthMaster FREE!, a fully working version of SynthMaster, a semi-modular software synthesizer and multi-effects plug-in that combines many different synthesis methods. The free version has 3 limitations. Windows only. KarmaFX offers KarmaFX Synth Modular, a VSTi plug-in for Windows, which provides modular patching of synth components and controls, plus many, many other features. Note that it's donationware. Check site for other donationware downloads. Devine Machine offers Minion, a free filter-based, multi-effects VST plug-in for both PC and Mac OS X. Many desirable features. Check site for other free downloads. Frieve offers Music Studio Producer, a free MIDI sequencer, DAW which can host VSTi. Check site for other free downloads. NCH Swift Sound offers WavePad, full-featured professional audio editing software designed to be a very easy and intuitive to use - Windows or Mac. Also, MixPad, multi-track mixing software designed for professional audio production - Windows only. Check site for other freeware. MUTOOLS.com offers MU.LAB Free, a free virtual music studio designed for composing and performing many kinds of music - Windows and Mac. Hermann Steib offers VSTHost and SaviHost, free Windows applications that run VST instruments without the need of using a host sequencer - useful for software instruments on stage. Evenfall offers AmbiLoop, a free Windows software application that uses your sound card to create smoothly overlapping loops of sound in real-time. Topten Software offers Cantabile, a free VST host, MIDI and audio recorder. Designed primarily for real-time playing of virtual instruments, Cantabile includes a highly optimized audio engine to minimize system load and reduce audio drop outs. Camel Audio offers CamelCrusher, a free distortion, compressor and filter multi-effect plugin - Windows or Mac. MacMusic has announced Model, an OSX AU modulation delay plugin. From classic echoes to strange modulations and musical patterns, users can "Model" their sounds and sequences with unlimited random modulation tweaks, powerful filtering and weird ring modulations. Les Productions Zvon offers Quad Zamp Free, a single-audio-out, one-shot, drum VSTi sample player, consisting of four Zamp-style multi-wav players (12 wavplayers in total), and Zamp, a simple VSTi sample player which can load and play 3 wav files simultaneously. Windows only. Note that Quad Zamp Free is freeware, but Quad Zamp 1.1, which has multiple audio outputs, is not. DontCrack.com offers hundreds of freeware downloads for Mac and PC targeted to musicians, audio programmers and sound engineers. D-LUSION Interactive Media now offers free downloads of RubberDuck, a virtual analog bassline synth, roughly based on the Roland TB-303 sequencer, and DrumStation, a software drum machine which synthesizes vintage TR-909, TR-808 and TR-606 sounds. Propellerhead Software's legendary ReBirth 2.0.1 is now available for free at ReBirth Museum. KarmaFX offers KarmaFX VST Plugin Pack, which includes filter, delay, reverb, and synth (the synth is a beta version). This is donationware, which means that the author requests a voluntary donation to support his work. delaydots.com offers PitchWorx DX, a free plug-in which allows you to adjust sample pitch or tempo independently of one another. Hurchalla DSP offers Maple Virtual Midi Cable, a free MIDI driver for Windows that you can use to connect together almost any MIDI applications. Very useful! Also, Maple Midi Tools, a free software program for Windows that hosts MIDI plug-ins. Voxengo offers several free VST plugins at its downloads page, plus Free Reverb Impulses. Kjaerhus Audio offers its Classic Series, seven free VST plugins that work, feel, look and sound as good as professional hardware FXs. Audiograbber is now freeware and no longer has any built-in restrictions. It copies digital audio from CDs digitally - not through the soundcard - which enables you to make perfect WAV copies of the originals. It can even record vinyl LPs or cassette tapes and make WAV or MP3 files from them. It can also automatically normalize the music, delete silence from the start and end of tracks, and send the tracks to external MP3 encoders, or even use some MP3/WMA encoders internally for automatic creation of MP3s. UGO offers four free PC VST softsynths: Texture, Rez, Motion, String Theory. Audacity is a free, open source, cross-platform audio editor that allows you to edit sounds, mix tracks, and apply effects to your recordings. KRISTAL Audio Engine is a free multi-track recorder, audio sequencer and mixer, ideal for getting started with recording, mixing and mastering digital audio. Superwave P8 by Chris Gill is a free virtual analog synthesizer emulation for VST hosts (Win 98 or better). iZotope, creator of Ozone, Trash and Spectron effects, has released Vinyl 1.6, which creates authentic "vinyl" simulation, as if the audio is a record being played on a record player. This latest version adds DirectX automation, which allows you to change parameters in Cakewalk SONAR, Sound Forge 7, Acid, Vegas, etc. Also added: support for Cakewalk "record automation" and Pro Tools versions (RTAS and AudioSuite). This is probably the best "vinyl" simulator available, and it's free. Studio Buddy, written by pro audio engineers, is a free, easy-to-use Home Recording Helper database that puts the answer to common audio questions right on your desktop. Mac or Windows. Crystal for Windows or Mac is a free VST Instrument plug-in which offers many interesting sounds, as well as the ability to edit them. Note that it's memory and CPU intensive. Check Green Oak for other effects freeware (for Mac only). SimulAnalog Guitar Suite is a freeware suite of seven VST PC plug-ins which simulate the following guitar amplifiers and stompboxes: Boss DS-1 (Distortion stompbox), Boss SD-1 (Super Overdrive stompbox), Tube Screamer (Overdrive stompbox), Oberheim PS-1 (Phaser stompbox), Univox Univibe (Modulations stompbox), Fender Twin 1969 (Guitar amplifier) and Marshall JCM900 Dual Reverb (Guitar amplifier). Soundplant is a self-contained digital audio performance program that turns your computer keyboard into a fully customizable sample-triggering device. It allows the assignment of WAV and AIF files of unlimited size to 72 keyboard keys, with no external devices needed and no MIDI involved. It can be used as a drum pad, to mix together tracks in realtime, to quickly sketch sound designs, or as a performance, installation, or presentation tool. Many more features. Windows, but an experimental Mac version available. Big Tick Audio Software offers excellent virtual synths: TickyClav, which emulates the funky sound of the Hohner Clavinet played in Stevie Wonder's "Superstition," and Cheeze Machine, which emulates the classic string ensemble sound made popular by the Crumar Performer or the Arp Solina synth. Both are standalone or VST plug-in modules, for PC or Mac. Check for other freeware downloads at the site. Bram Bos has released Tuareg2.5, an upgrade of his popular interactive Phrase Sampler which makes music and sound out of samples you feed it. In Freeware Mode, Tuareg2.5 is fully functional - it is not crippled, mutilated, time limited, etc. - but it has fewer features than the Extended Mode. If you have a valid Tuareg 1.x serial key, you can use it to unlock the Tu2 extended mode - for free! Also from Bram Bos, HammerHead Rhythm Station is a popular, free software Drum Machine for Windows. Make your own powerful dance drum beats for your sampler/tracker. Check out the other free sound and software downloads at the site. MIDInight Express is a programmable software wavetable MIDI player and MIDI-to-WAV renderer. converter, from urr Sound Technologies Inc., is a professional real-time midi performance system for use in both studio and live applications. Designed to ensure maximum performance, bullet-proof reliability, and exceptionally low latency with low hardware requirements, converter offers a highly versatile, programmable, and friendly environment for both commercial and experimental music production. It also provides advanced audio to midi conversion, along with many other features. Requires a DOS-capable operating system. Note Attack! v1.34, from Aspire Software, is an educational video game for learning to read sheet music. Use your computer keyboard, or your MIDI-compatible piano or keyboard for input. The Line6 POD X3 Guitar Bass and Vocal Modeling Processor offers the most complete collection of POD-quality guitar amp, cab, stompbox and studio effect models ever - an arsenal of rare vintage treasures, modern boutiques, and perennial classics. The Rode NT1A Studio Condenser Microphone gives professional results with any input source. It features a wide 132 dB dynamic range and a maximum Sound Pressure Level of 137 dB to cover the quietest cymbal chimes to the boomiest bass parts with equal clarity and presence. The full-range frequency response from 20 Hz to 20 kHz is capable of reproducing whatever you record with spot-on accuracy. Use it as a room mic for rhythm and instrument tracks, then prop it up on a boom stand for rich, warm vocals. The Alesis ADAT HD24 Digital Hard Disk Recorder offers incredible performance and stability, thanks to Alesis' unique methods of writing to the hard drive. Designed and built exclusively for recording music, not data. HD24 is the first disk recorder to match the ADAT's legendary perfomance and affordability, and it fits into any existing ADAT system. IK Multimedia SampleTank XL Sampler/Synth Plug-In is the ultimate sample-workstation. With an exclusive combination of features and sounds, SampleTank stands apart from any other sample-based virtual instrument, as one of the most powerful and easy-to-use solutions for making fully produced songs out of the box. Ableton Live 8 Music Production Software is revolutionary software that allows you to spontaneously compose, record, remix, improvise and edit your musical ideas in a seamless audio/MIDI environment. Like to work on do-it-yourself music equipment projects? A new category of links, Do-It-Yourself Resources, has been added to our Schematics and Manuals page. 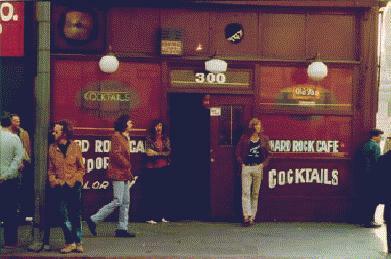 Want to collaborate with other musicians online? A new category of links, Online Recording Collaboration, has been added to our Indie How-to page. We are proud to report that Musician's Tech Central has been given the Top Of Everything Award for being rated as one of the Top Sites in the "Musical Equipment" category by TopOfEverything.com. How do they do that? Browse our How-to Articles page, a large and growing collection of practical information and links to information for musicians, from beginners to experienced, who are building home studios and taking hands-on control of all stages of music production. Also, visit our Tech Q&A page for answers to technical how-to questions.